These decoration ideas are so easy and inexpensive to make, they’re guaranteed to spread holiday cheer. 1. 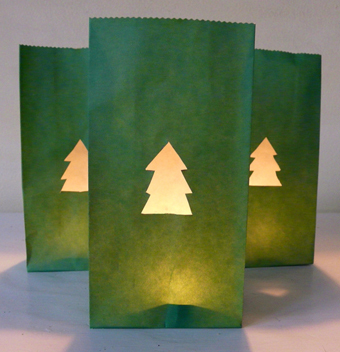 Using a pencil trace the cookie cutter or ornament on one side of the paper bags. 2. Cut the shapes out with scissors. 3. Open the bags and place a tea light inside. 4. Display on a mantel, dining room table and/or anywhere else you wish; light and enjoy the festive glow. Safety note: never leave lighted candles unattended. 1. Clean off branches and remove any stray leaves. 4. Remove the white cord tied to the shipping tags and replace with the red ribbons. 5. Place the branches in a large vase, decorate with your “wish” tags then place on a mantel or side table or use as a centerpiece. Note: Leftover ribbon and shipping tags make perfect gift tags for your holiday presents. 1. Place leaves between the pages of a heavy, hardcover book and leave overnight to press out any wrinkles. 2. Set your leaves on a drop cloth and spray paint outside or in a well-ventilated room or garage; let dry and repeat on the other side. 3. Once dry, use them all over the house as silvery festive decorations: String them up using white thread to create a garland or curtain; tape them on windows, sprinkle them on mantles around candles or a holiday arrangement, use them as place settings or dress up a serving platter—the ideas are endless!